Starfish belong to the family Asteroidae within the phylum Echinodermata. There are over 2,000 species of starfish. Marine biologists are trying to get the term "sea stars" to catch on, since they are not fish, as they have no spinal column or central nervous system. People are most familiar with the common five-armed varieties, but some species have up to 40 arms. While there is a huge diversity among species, all are marine (ocean-dwelling). As a general rule, starfish with smooth skin work well in reef tanks, but starfish with knobby or spiny skin will harm sessile (immobile) invertebrates. The chocolate chip starfish (Protoreaster nodosus) is a good example. It has bumpy skin, and resembles a five-armed chocolate chip cookie. It comes from the Indo-Pacific region, and is most common in the Philippines. They can grow up to 16 inches across, but most specimens are much smaller, reaching only 4 inches or so. They are hardy, but will eat a wide variety of expensive coral and other reef invertebrates if given a chance. The blue starfish or blue sea star (Linckia laevigata) has a widespread distribution in the Indo-Pacific region. It is a great example of the other side of the "bumpy skin rule;" it has smooth skin and doesn't bother other invertebrates. It is mostly a scavenger and makes a great addition to a reef aquarium. It can be trusted with corals and other invertebrates. The crown-of-thorns starfish (Acanthaster planci) does not work well in most home aquariums. They can grow to more than two feet across, too large for most home aquariums. They are infamous for decimating reefs in their home range, the Great Barrier Reef off of the northern coast of Australia. They have spiny skin that discourages most predators, and can eat vast amounts of coral. 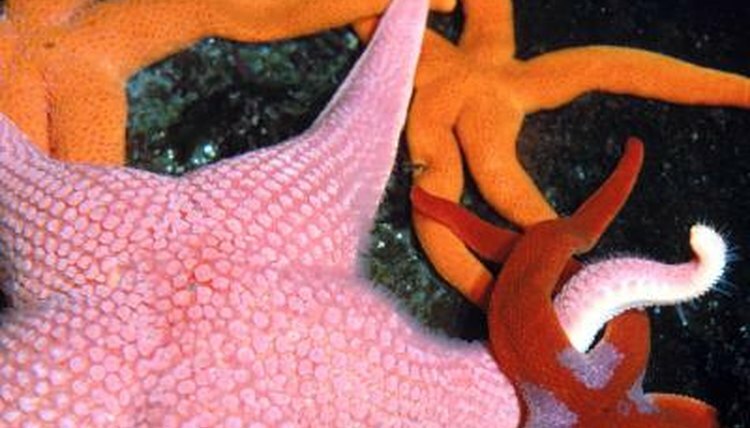 The red-knobbed sea star or red-knobbed starfish (Protoreaster lincki) has an Indo-Pacific distribution. It is widely available in the aquarium trade. They are the exception that proves the "bumpy skin rule." Despite having bumpy skin, they do not bother most other invertebrates. They mostly eat algae. They will benefit from veggies added to their diet. They stay small and have a bright red color with bumps on their skin.